Waking up at specified time. Browse to a particular website at a specified time. Make a reminder of some task and get notified at the appropriate moment. In order to make proper use of the alarm the computer must be kept running and the tab must not be closed. 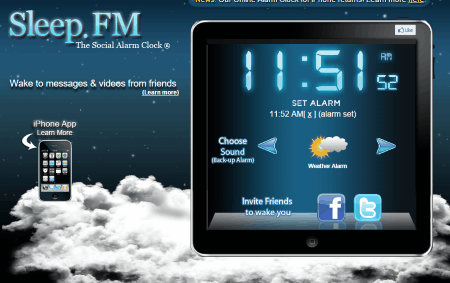 Out of this extensive list the best free online alarm clock website that I like the most is TimeMe. It is because this free website lets you set a number of alarms at a time as compared to most other websites which let you set just a single alarm. Here you can also set the alarm duration, and can also save the link to your alarm so that your alarm remains saved and can be brought into action again by a single click. It also features a number of other products as well, like: timer, stopwatch, countdown timer, countup timer, split lap timer, and chess timer. 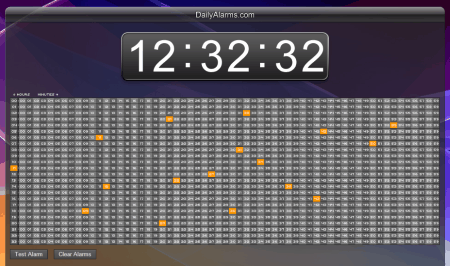 Also check out the list of Alarm Clock Software, Christmas Countdown Clocks, and Calendar Software. 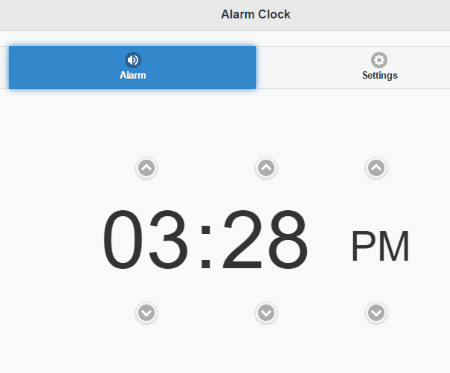 TimeMe is a simple online alarm clock website which lets you set several alarms for free. On visiting the site you are displayed with an online digital clock. On clicking the alarms button you are taken to the alarm list where you can add a number of alarms. Here you have to set the time, color, alarm tone and the number of cycles. Click on the button update alarm time points which sets the alarm. At the specified time the alarm rings. You can also change the title, font, and various other settings. You can also save link to your alarm clock so that your settings remain saved so that you don't have to go through the same process every time. Along with it there are a number of other products as well, like: timer, stopwatch, countdown timer, countup timer, split lap timer, and chess timer. 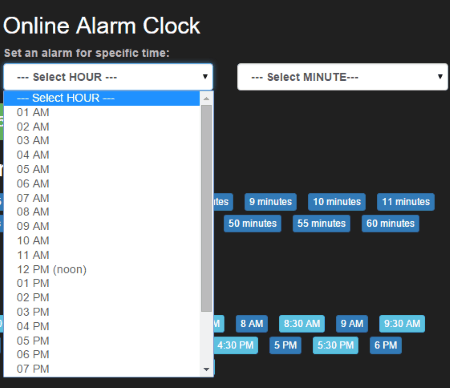 DailyAlarms.com is a very simple, beautiful, and easy to use website where you can choose to set alarm clocks. 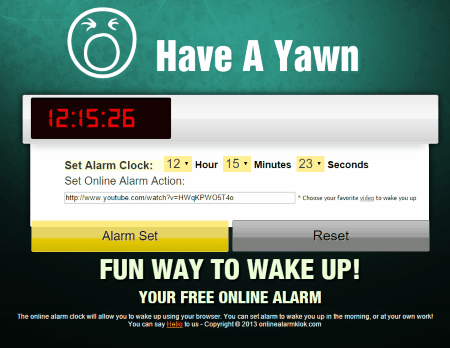 Setting alarm clocks in this website is quite easy, with just click of a button. Just click on the time grid at the time you want to trigger the alarm. 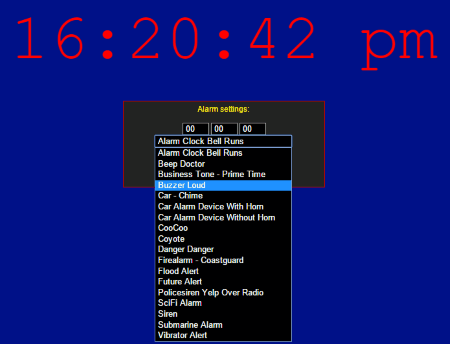 The selected alarm times are highlighted in orange color. 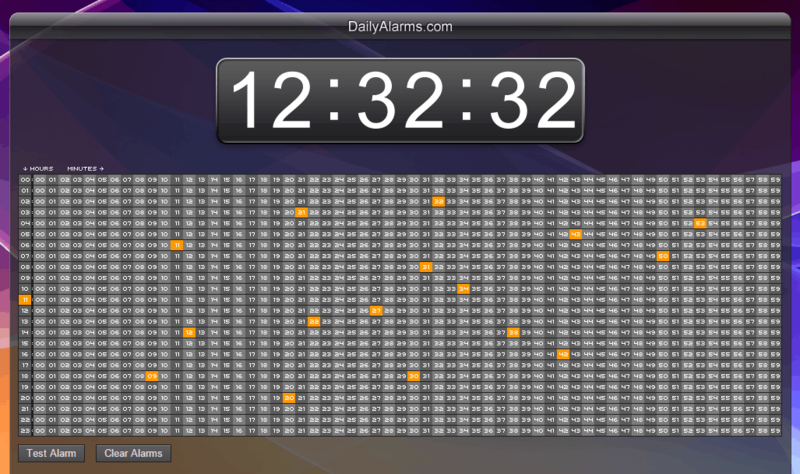 Here you can set a maximum of 1440 alarms daily for each minute of the day. At the selected time the alarm rings which can then be stopped. Even when you close the browser the alarms remain saved. You can also choose the option to update the time interval after 15, 30, 45, and 60 minutes. Set the snooze time interval, select from a list of YouTube videos, or set the URL, and the alarm volume. After that click on the button set alarm. At the specified time the video plays in order to wake you up. It also features a simple alarm clock where you have to just input the time, select the time, and click on the button set alarm. It also hosts an online notes, and online timer service. You can choose a time interval from the list. To turn on the alarm at any specific time, choose the time at which the alarm is to be sounded. In case you want to increase or decrease the timings that is predefined you can always do so. It also features a timer. On clicking the set timer button, the alarm is activated. After the alarm rings you can choose the snooze or stop option. 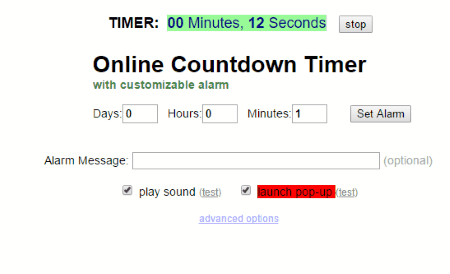 OnlineClock.net is a simple website where you can set online alarm clocks. On browsing the website, the current time is displayed. Then set the alarm time and relax. After the time is reached the alarm rings and the option to switch off the alarm is displayed. You can also personalize the display of the webpage where you can choose the background color, clock size, background image, sound, and so on. Also there are a number of theme options to choose from where you get different backgrounds and sounds based on your mood. 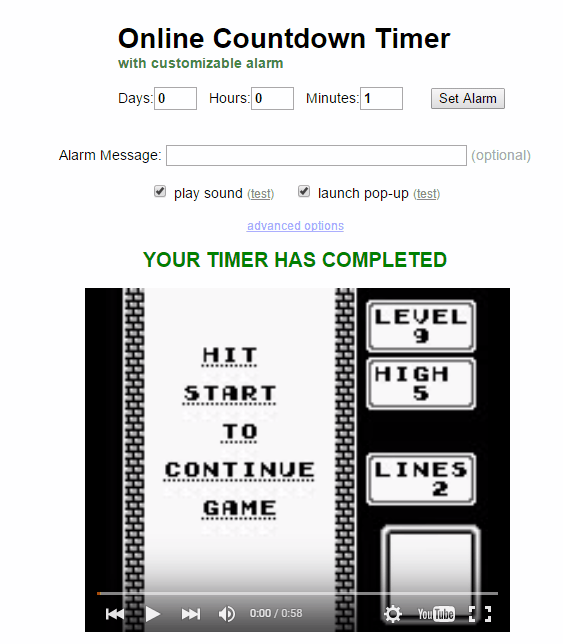 You can also make use of timer, stopwatch, countdown, counter, and radio. 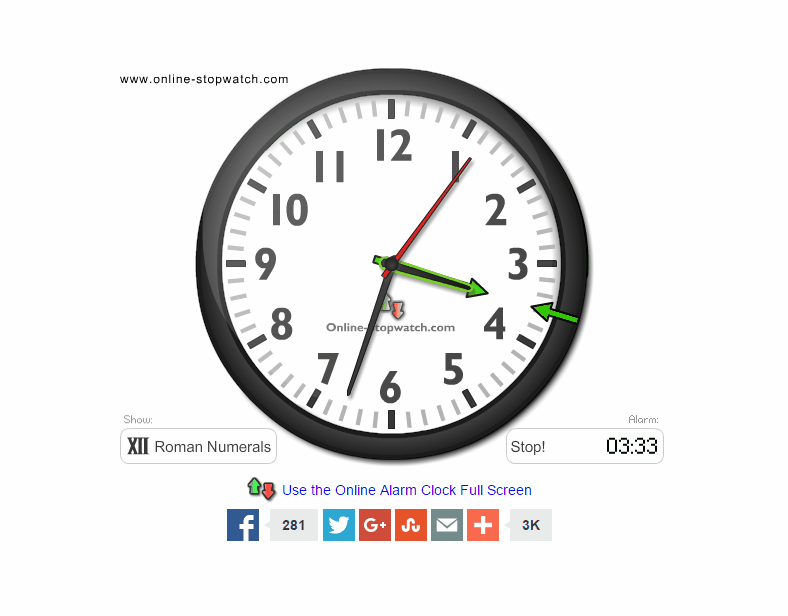 RapidTables has a very simple and easy to use online alarm clock. On startup you are displayed the digital clock showing you the time, day, and date. Browse to the alarm tab and set the time for the alarm. Under the settings tab you can set the sound alarm, and vibration as on/off. You can also enable text alert, set alarm volume, and alarm tune. You can also change the clock settings, like: 12/24 hour display, time display, low CPU/low power, color, and font. Other applications like calendar, countdown timer, view current time, today's date, and stopwatch can be put to use. 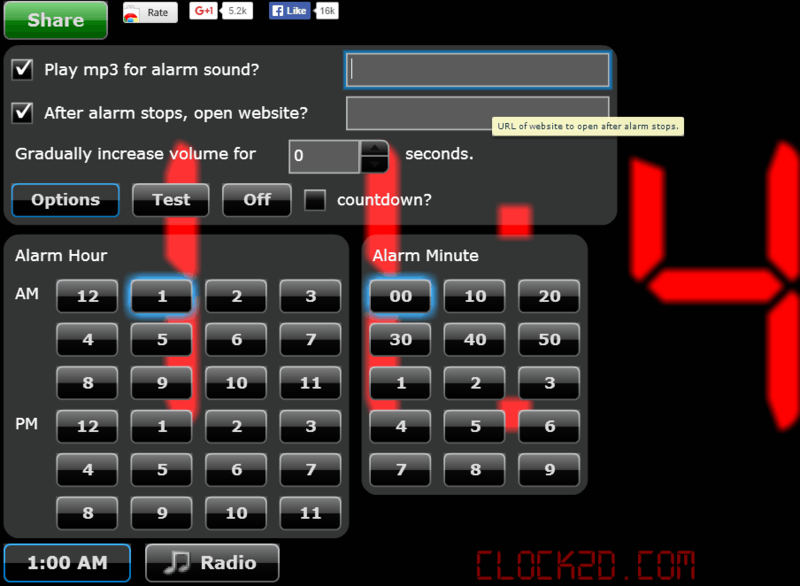 CLOCK2D.COM is a simple online alarm clock website. 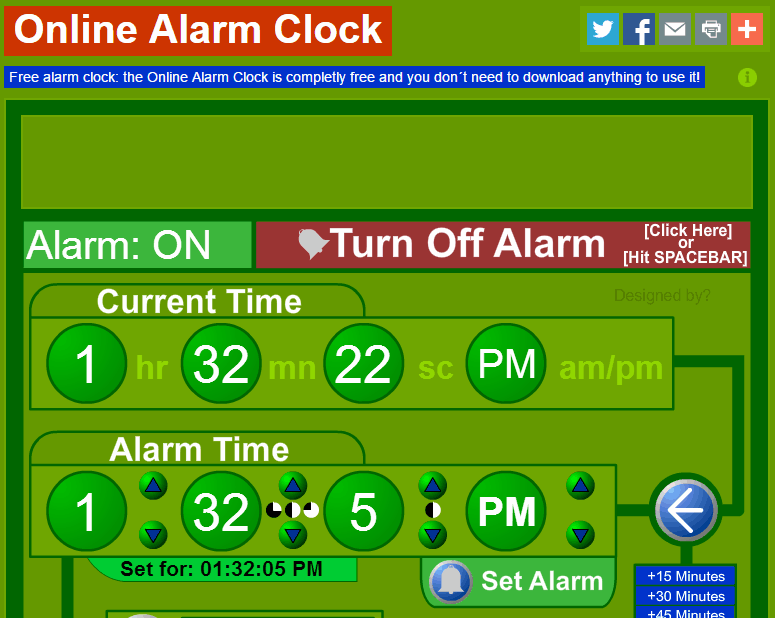 Here just go to the alarm time displayed and click on appropriate buttons to set the alarm time. 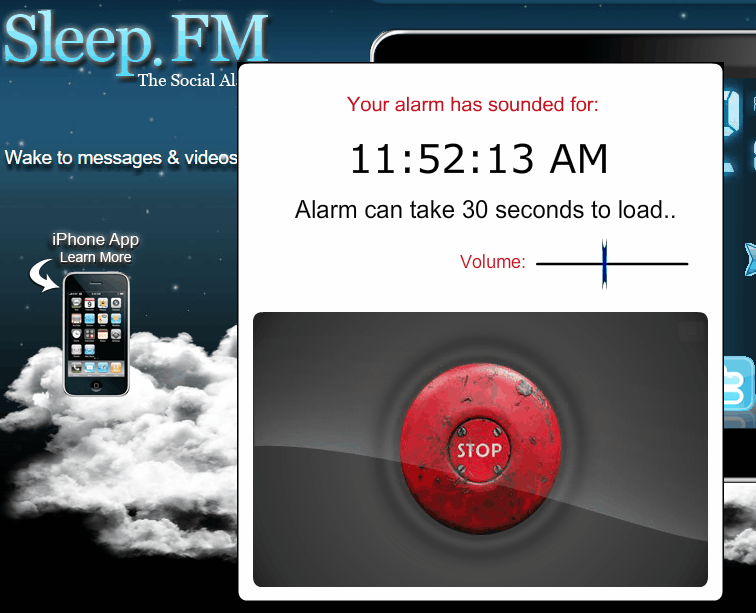 The option can be chosen to select the mp3 link to play for alarm sounds and to open an website after the alarm stops. On choosing the option of countdown, you are displayed the remaining time instead of the current time. At the specified time the alarm rings and you can choose the option to snooze the alarm or stop it. Different backgrounds can be selected from the menu tab. Onlive Clock is a simple clock that shows you the current time, and also lets you set the alarm clock. Here you have to simply select the time when you want the alarm to ring. At the specified time the alarm rings which can be closed as and when you wake up. In the settings tab you can change its settings where you can choose the option to auto hide, say time, change clock format, change background, and enable snooze button. Sound settings can be changed and if required you can also choose to play videos from the YouTube by adding the YouTube link. Along with it you can also tryout its other services like calendar, stopwatch, timer, kitchen timer, countdown, and radio. Anvoy.com is a simple Flash website which also features an online alarm clock. On clicking the link the website displays the current time, date, and day. Then click on the button click here to set alarm. Set the alarm time, choose the sound and you are good to go. At the specified time alarm turns on where you can choose the option to either snooze the alarm or turn off the sound. You can also change the alarm time at any moment. 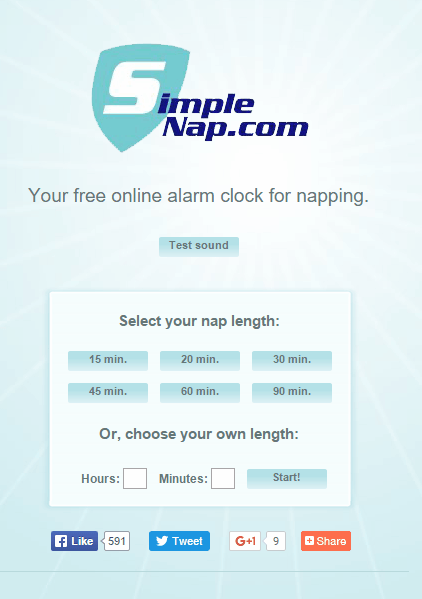 SimpleNap.com is a very simple and easy to use website where you can simply set alarm with the click of a button. 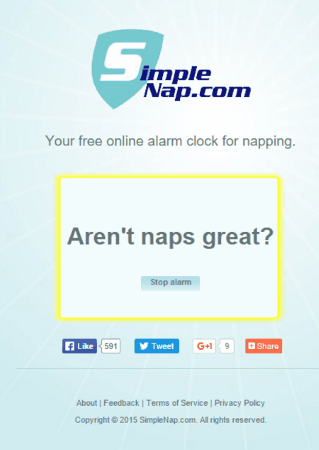 There are a number of predefined time duration to select to take the nap. Choose from the predefined options of 15, 20, 30, 45, 60, and 90 minutes. Or choose your own time of nap and add a duration in hours and minutes. On clicking the start button the timer starts which you can cancel at any moment of time. After the time limit is reached the alarm is sounded which gradually becomes louder till it is turned off. Then you can again choose to start a new nap. 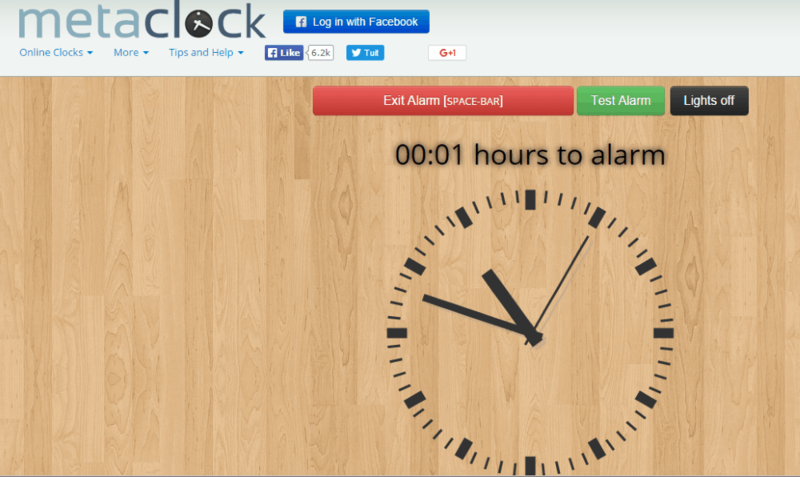 OnlineClockAlarm is a simple website where you get an online alarm clock. Set the time at which you want the alarm to be sounded by selecting the hour, minute and second button. Select the sound option to be played that may be chosen from default options, or the file that you upload, or provide the link that you want to be played. Then set the alarm button on and at the specified time the alarm rings, till you close the wake up button that pops up. 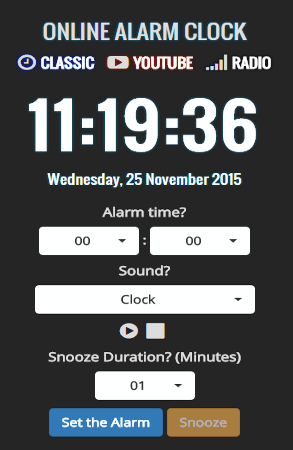 You can also make use of timer where you choose the time duration after which the alarm is sounded. It also features a chronometer. 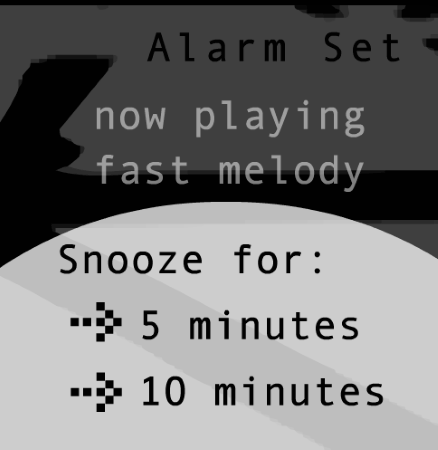 Set the alarm time, choose the tune, and click the option to set alarm. You can also upload your own tune. After you set the alarm the countdown timer is activated, showing you the remaining time for the alarm. At the specified time the alarm rings, which can be shut down at any time. You can also choose the option to change the background image. The note can be shared on the Facebook wall when you wake up but for that you have to login to the Facebook. Click on the button alarm is off. Choose the option to either select the option of either hour hand or minute hand. Then you have to move the green button to set the alarm time. Then you can shut down the alarm. 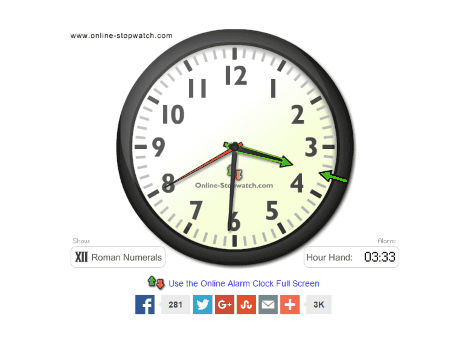 The settings can be changed to display either the roman numerals, Swiss clock, or 12 numbers options. Different other gadgets like countdown timer, stopwatch, timers, and many more can be put to use. 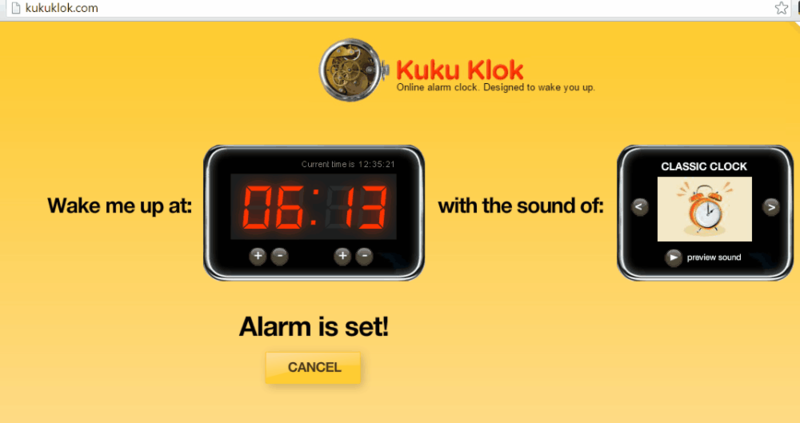 KukuKlok is a simple online alarm clock website. 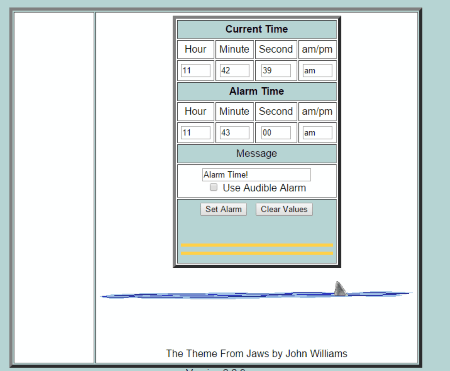 Here after you browse to the website an alarm clock is displayed. At its top the current time is displayed. 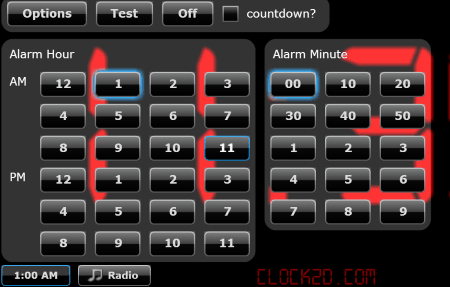 Using the set of four buttons you can set the alarm time and set the alarm sound. In case you want to preview the sound you can do it. Then on clicking the set alarm button the alarm is set for a specified time interval. At the specified time duration the alarm rings where you have to choose the option to snooze the alarm, or stop the alarm. ALARMd is an alarm service provided at zachleat.com. 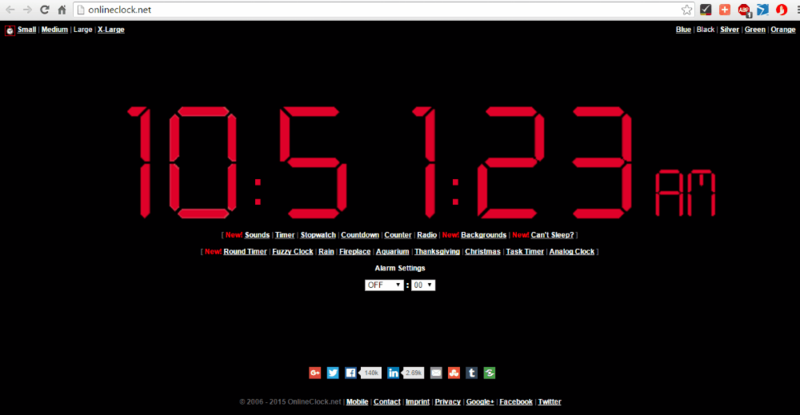 On opening the site the time is displayed in a digital clock format. In order to use this feature you have to add the alarm. Then select from different sound option which may also comprise generic sounds, FM, or YouTube videos. 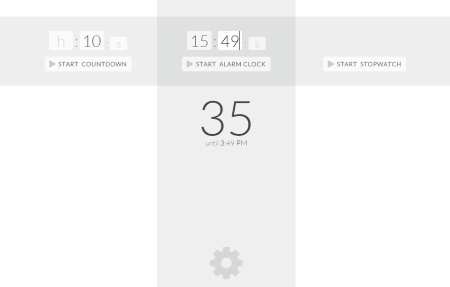 You can select different days options to activate the alarm, and also add different alarms. The time can be viewed in either 12 hour or 24 hour format, to hide the seconds button, or display it, and to view the countdown for the alarm. 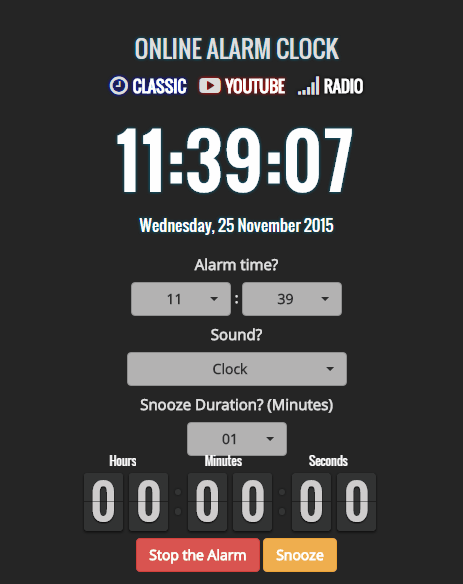 Sleep.FM is a sleek looking website which can be used to set the alarm. Click on the button set alarm, set the time, select the sound, and you are good to go. At the specified time the alarm rings and displays the alarm sounding time, volume, and a stop button. You can also invite your friends to wake you but you have to log in via Facebook first. Then your friends can choose three different YouTube videos and you are notified to wake up from the sound of those videos. 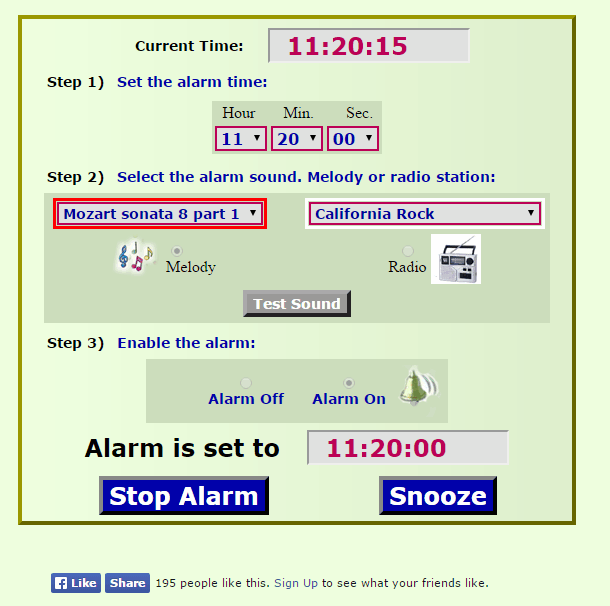 naked alarm clock is a simple website with an online alarm clock. Firstly it displays the current time. 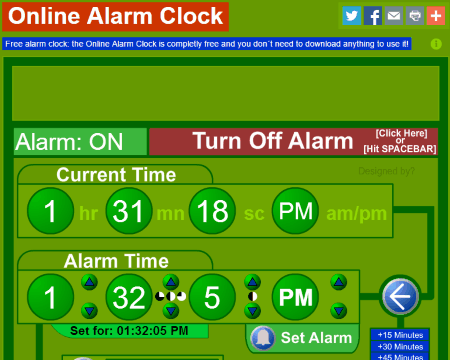 Set the alarm time using the buttons and click on the button set alarm. The alarm sounds at the specified time. The alarm tone can be set from a list of tones. In case you require to set quick alarm just choose the option to set the time limit of 15, 30, 45, or 60 minutes, and can further reduce or enhance the values. 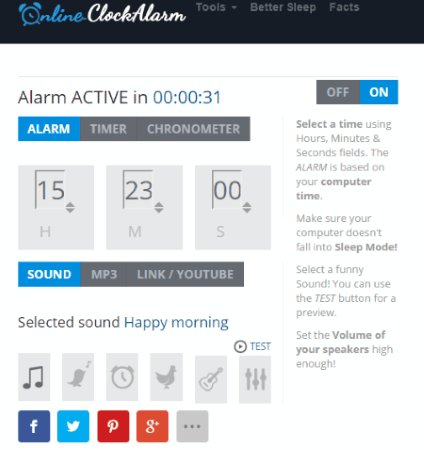 TIMEITY is a simple website which also hosts an alarm clock on its website. It displays the current time. Set the alarm time, and provide the link that you want to open which may be a YouTube link, any other website link, or the link of some alarm sound files available. Click on set alarm button and you are good to go. You can also reset the alarm at any moment. At the specified time the link you provided opens. onlinealarmkur.com is a website which features an online alarm clock. 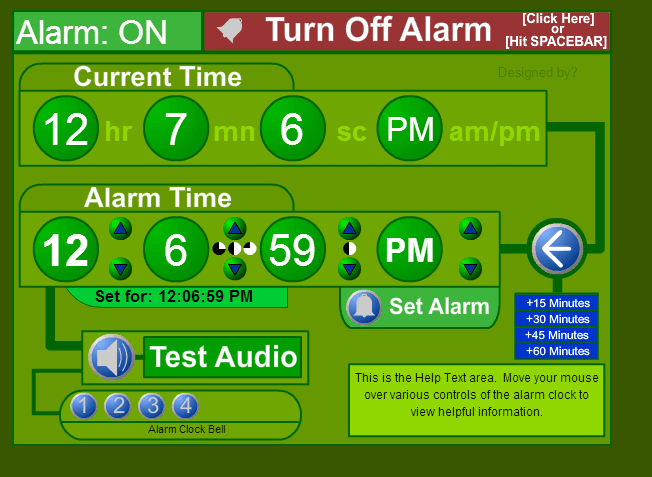 Here you just have to enter the alarm time, set the sound, snooze duration, and click on the button set the alarm. The countdown timer displays the time left for the alarm to go on. After the alarm goes on, you can choose the option to either snooze the alarm, or stop the alarm. It also can be used to select sounds from YouTube, or online radio. 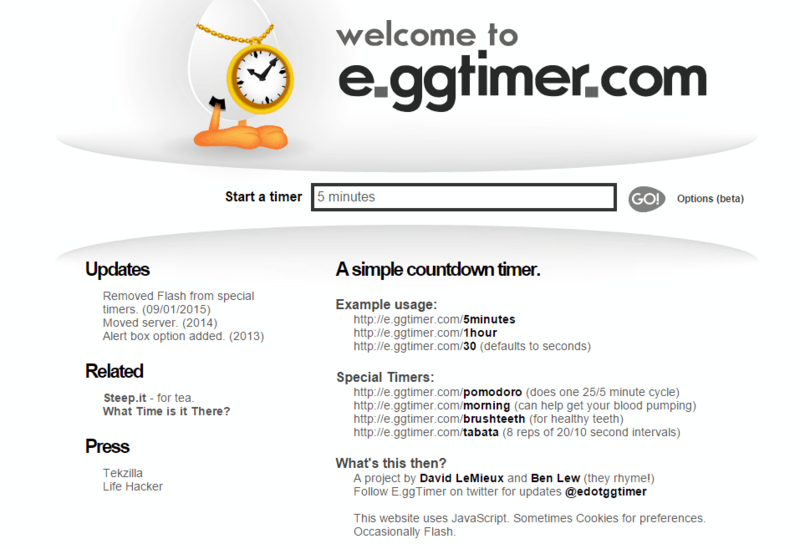 e.ggtimer.com is a simple website which features a timer which can be used to set online alarm. In the timer option enter the duration after which you want to sound the alarm, and click on go button. 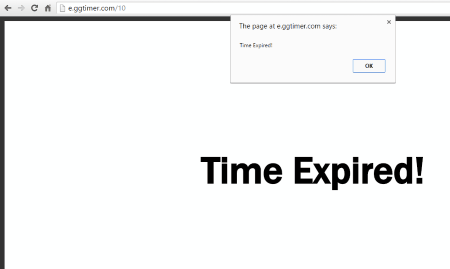 Or you can simply enter the time in the URL after the timer starts after which the message is displayed and the alarm is sounded. Few quick links are provided under example usage and special timers. 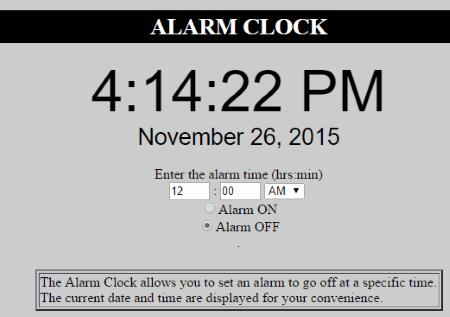 OnlineAlarmClock.ms is a simple website where you are provided with online alarm clock. The home page displays the current time. Set the alarm time and click on the button set alarm. The alarm rings at the specified time. The alarm tone can be set, and the audio can be tested. In case you require to set quick alarm just choose the option to set the time limit of 15, 30, 45, or 60 minutes. 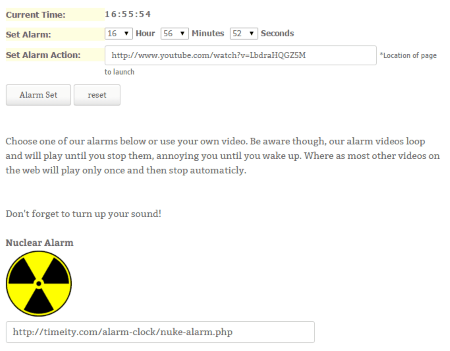 Click on the play button of the start alarm clock. Then set the time of the alarm after which the alarm is started. You can also change its settings like name, background image, and YouTube alarm where you can choose your own YouTube link. You can also make use of the countdown, and stopwatch feature. 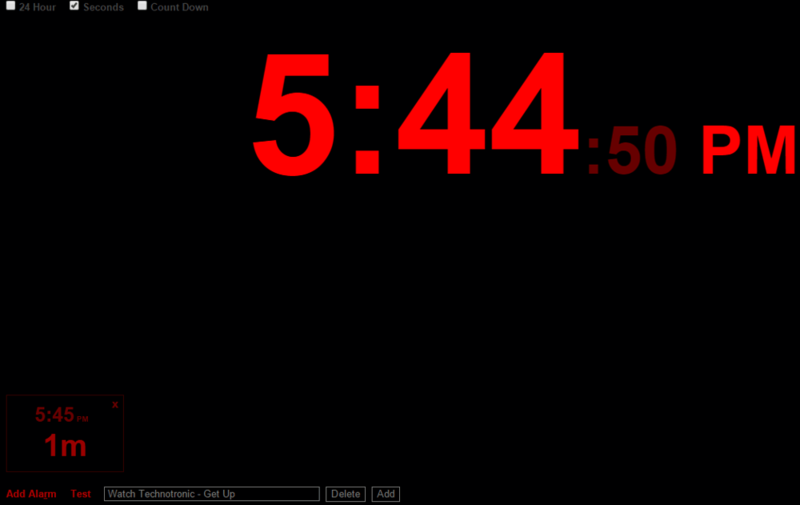 time-in.info has a simple online countdown timer which can function as an alarm clock. Set the time duration, set the alarm message, and you are good to go. If required you can also enter the YouTube URL, and the launch URL in case you wish to play the YouTube video on wake up, or launch a website. As the time ends the YouTube video is played and the specified site launches. Downloadastro.com is a sleek and simple looking website which has an online alarm clock. Click on the button set new alarm. Input the alarm time, select the alarm sound, and turn the alarm on. At the specified time the alarm sounds which can be turned off at will. It also features other timing apps, like: current time, timer, stopwatch, and countdown. 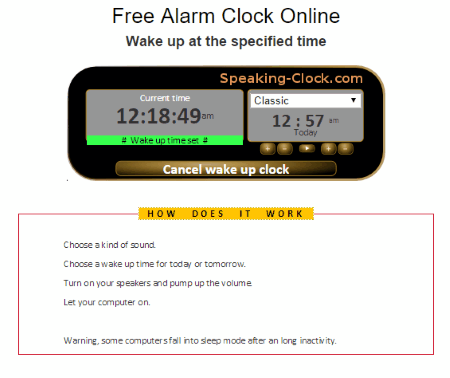 Speaking Clock features a simple online alarm clock which is quite easy to use. Here you have to just enter the alarm time, set the tune, and click on the button set wake up clock. Then at the specified time the alarm rings. 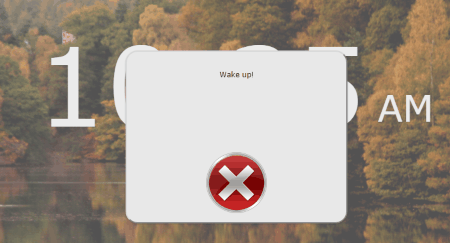 The alarm clock can be turned off by clicking the button cancel wake up clock. 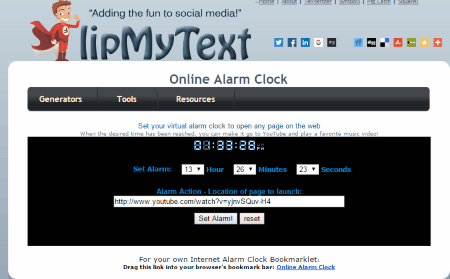 FlipMyText has an online alarm clock which can be used to set alarm clock for free. Just set the alarm time and choose the link that you want to be opened at the specified time. On clicking the set alarm button the alarm button the alarm is set. At the alarm time the webpage that is provided is opened. slaveclock.com is a simple website that can be used to set alarm clocks online. On start you are displayed with the current time. In the alarm settings select the alarm time, alarm tone, turn the alarm on, and click the submit button. At the specified time the alarm rings which can be then turned off. 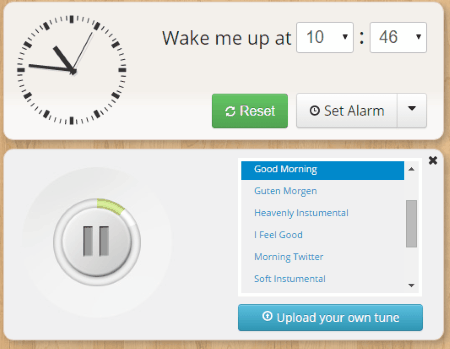 music-alarm-clock.com is a simple website which lets you use the online alarm for free. 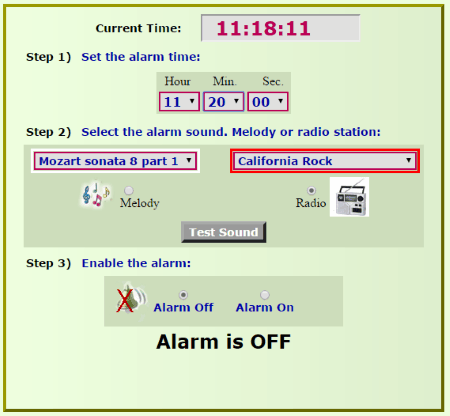 Just set the alarm time, select the alarm sound which may be melody or radio station, and turn the alarm on. At the specified time the alarm rings which can then be snoozed or switched off. 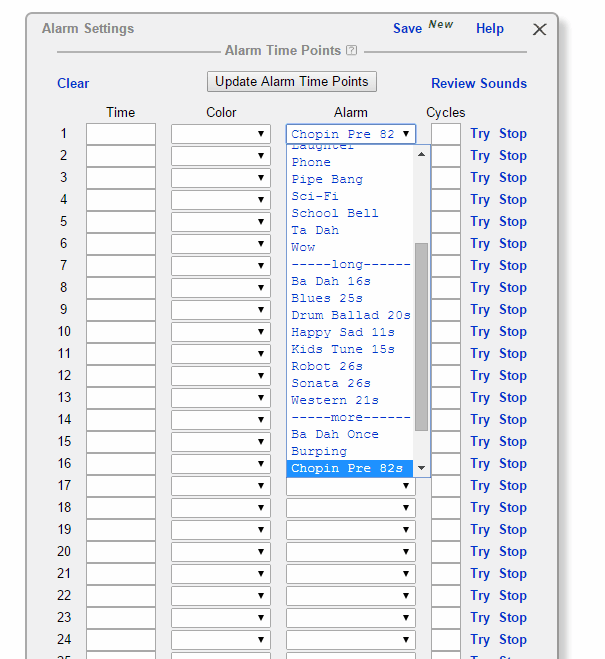 ALARM BUZZ is a simple online alarm site. Set the alarm time and choose the alarm action. 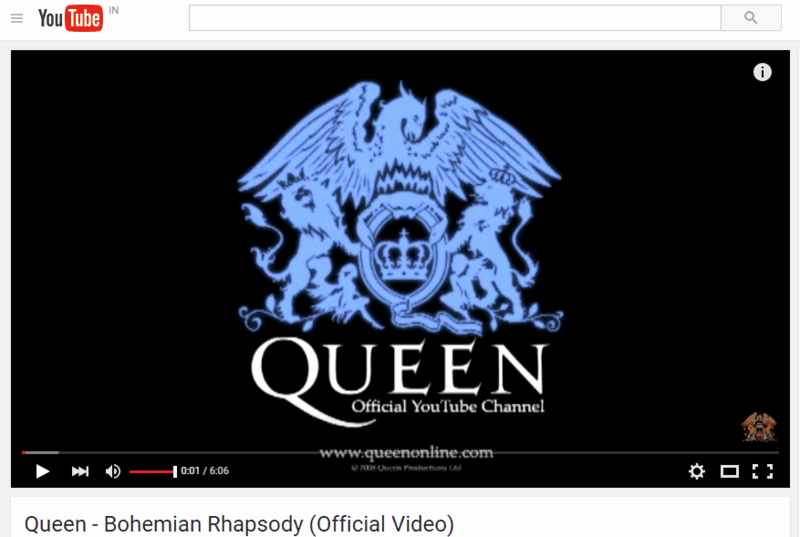 Here you can enter any YouTube link, or internet radio stream link, or any website link of your own. On clicking the set alarm button the link provided by you is opened. 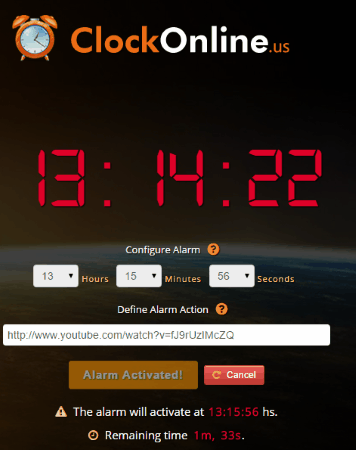 ClockOnline.us is a website where you can set online alarms for free. Just set the time, set the link which can be any YouTube, radio, or any website link, and click on the button activate alarm. At the specified time the specified webpage is opened. 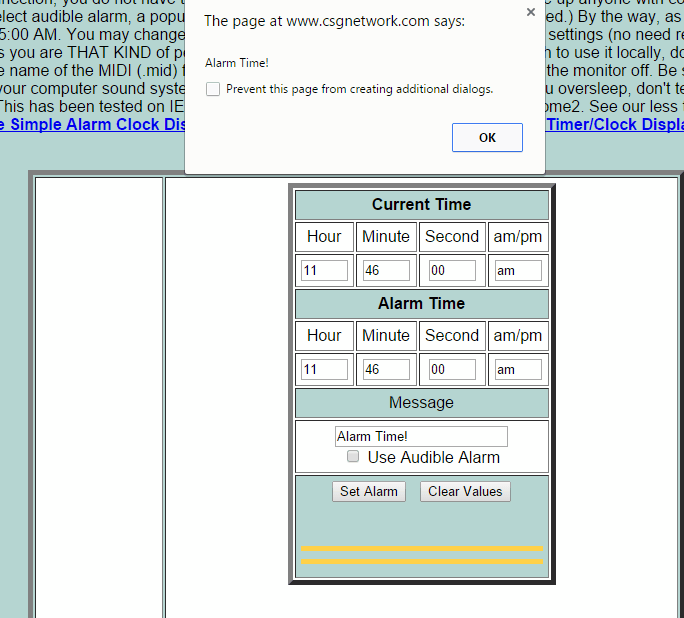 CSGNetwork.com hosts an online alarm clock. Just set the alarm time, set the message, and choose the option to set the alarm. At the specified time the dialogue window appears showing you the message. You can also tick use audible alarm check box to play the sound. 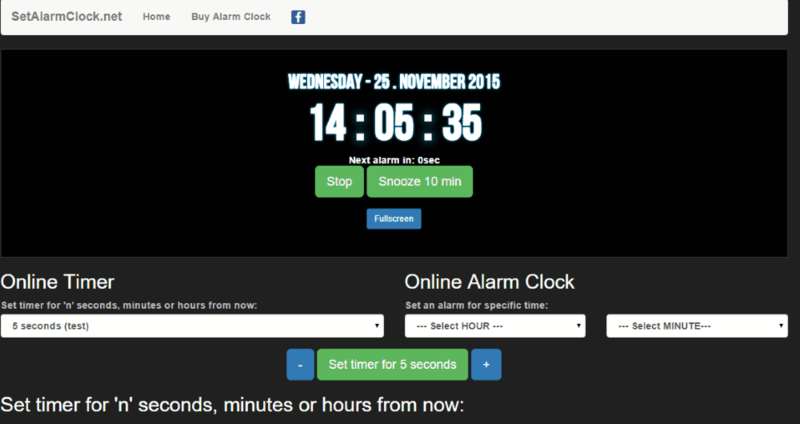 onlinealarmklok lets you set the alarm clock where you can set the alarm and set the action to be undergone at the alarm time. Set the alarm clock time, and choose the link that is to be opened at the specified time. 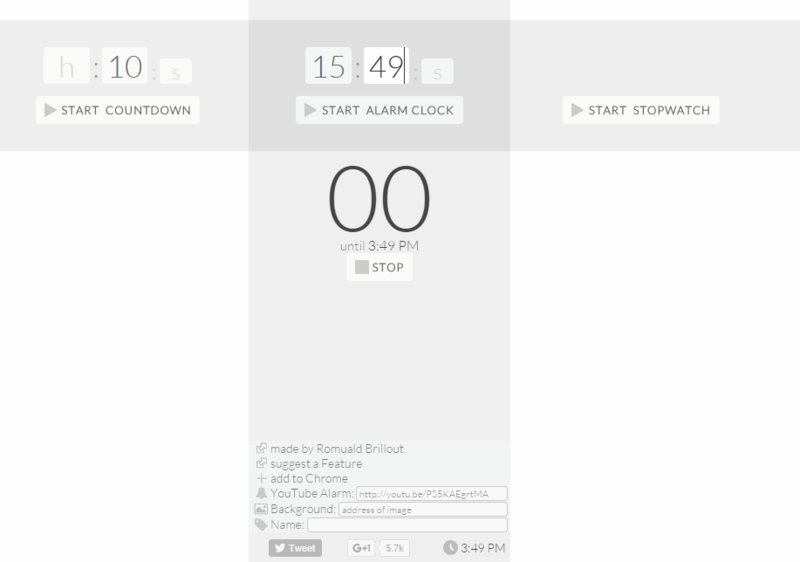 MINI WEB APPS features a simple online alarm clock. 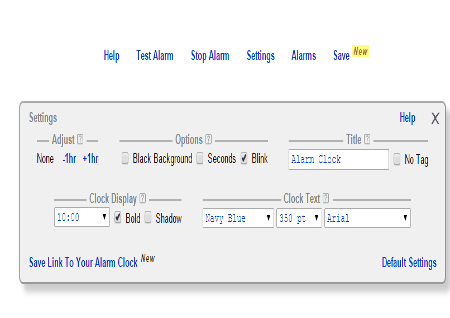 Just select the alarm time by using the buttons, and click the alarm button. At the specified time the alarm rings which can be closed by clicking on the alarm button again. wwwwdot.com is a simple looking basic website which features an online alarm clock. Here you have to just enter the time, snooze option, choose alarm sound file. 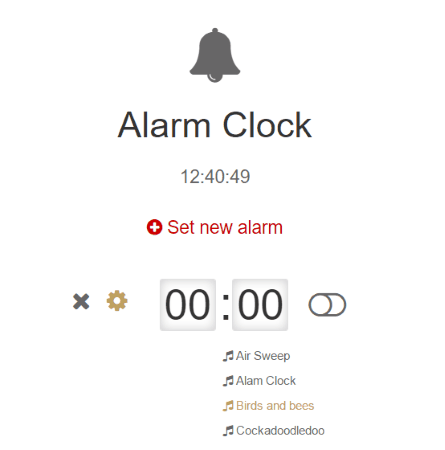 timfick.com features a very simple and easy to use alarm clock. Set the alarm time and turn the alarm on. At the specified time the alarm is sounded.